A few months back, I surveyed my audience to figure out their biggest challenge. If you look at the results, you’ll find that more than 60% of respondents struggle with how to best use their time. But “I don’t know what to prioritize” is also about time; prioritization is about where you and I ought to spend that finite (and most important) resource called time, so that we can create the biggest impact in the least amount of energy. And of course, if you include “all of the above” – in a not ironic way, this is also a time-management issue. After all, if everything is a challenge, it most likely means you don’t know where to spend your resources, the most important being time. Is there something you and I can do to improve our time-management, to make sure we spend time on the RIGHT things (not on wasteful, energy-draining, trivial tasks), and to make sure we’re optimizing our life and business through better use of our time? And it starts with tracking your time, analyzing it, and then making educated decisions on how to use your time. In this blog post, I want to share 3 reasons why you should track your time, some of the tools I use to track time, and some of my personal “best practices” when it comes to both time tracking and time-management. How much time do you spend on social media every day? How about on your favorite news or sports sites? Or what about reading that guilty-pleasure blog or listing site? Chances are: more time than you realize. Of course, there’s no way to know unless you are actively tracking your time. When you track your time, especially if you’re diligent about tracking every time you shift tasks (even if its to social media, that guilty pleasure blog, etc. 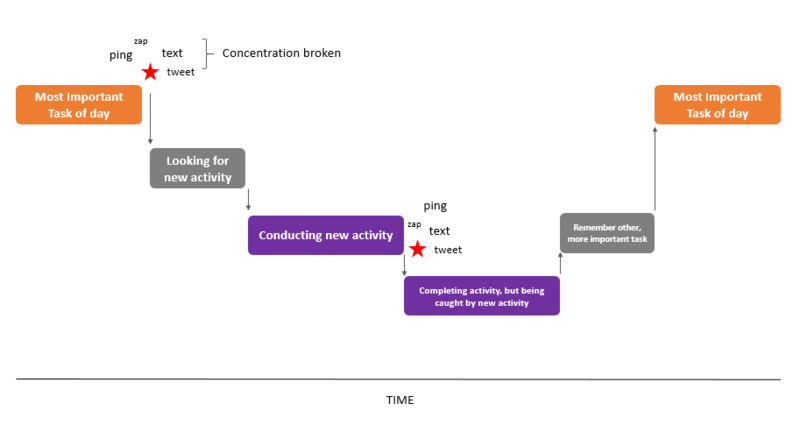 ), you’ll recognize how much time you spend on non-essential activities. And like G.I. Joe says, knowing is half the battle…because then you can find ways to reduce time-wasting activities. Last October, I decided to see where I was wasting time, and started tracking my time, 24 hours a day, 7 days a week, for a month. What I found was that I spent at least an hour a day on news and blog sites during my work day. Not the worst thing in the world…except that this 1 hour was split up over multiple occasions. This meant I was switching tasks more frequently, and the more frequently you shift tasks, the longer everything takes. When I stopped to do the detailed analysis, I found that I wasted about 1.5 – 2 hours a day perusing my favorite news outlets and blogs – not because I was actively on them for that long, but because distraction produces a ripple effect. Once I started tracking my time, I became cognizant of the time I was misusing, which encouraged me to remove this waste (by creating social media newsfeed blockers, website blockers, and more). Project A that generated $20,000 in revenue, or Project B that generated $30,000 in revenue? You don’t know unless you know how much time and money (and time is money, amiright?) was invested into each project to generate that amount of money. For example, this past year, I worked on a project (we’ll call it Project X) that generated $15,541.65 in revenue. A few months later, I worked on a project (we’ll call it Project Z) that generated $3,000.00 in revenue. After project-specific expenses (wages of employees based on their hourly-equivalent salary), Project X generated about $8,820 in profit. Not bad. (note: these are rough numbers, and technically that’s not profit because I have other overhead business expenses, but for illustration purposes, let’s go with it). 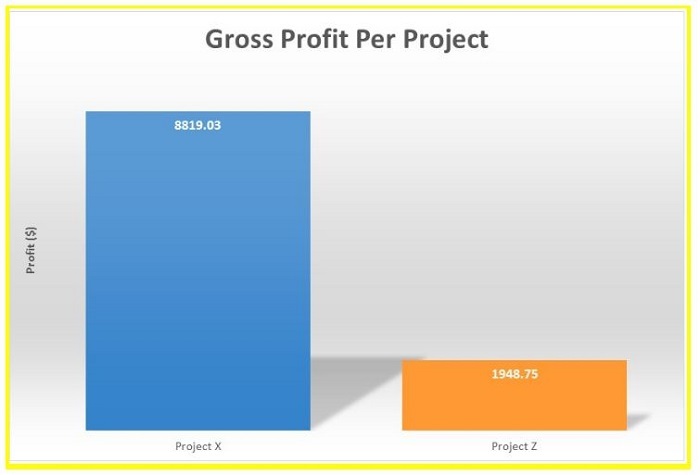 Using the same formula as above, Project Z generated about $1,950 in profit. $8,820 in profit is better than $1,950 in profit, right? If you said “trick question” – you’re catching on. Because Project X cost so much to deliver, it actually had a LOWER return on investment than Project Z. 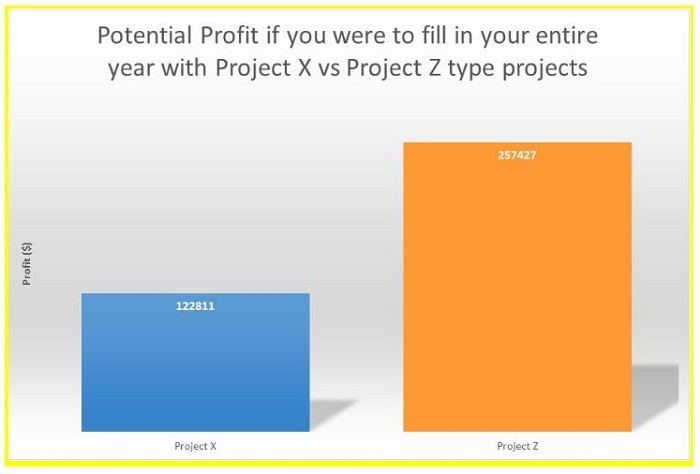 Using Investopedia’s formula for calculating ROI (gain from investment – cost of investment / cost of investment), it’s pretty clear that while Project Z didn’t generate as much profit as Project X, because I was also able to invest less to produce that profit, Project Z has a better overall ROI. According to a 2015 CNN Money article, the average full-time adult employee in the U.S. works 47 hours per week. So let’s say you work 47 hours every week for a year with no vacation, that would be 2,444 hours per year. If you filled all 2,444 hours with projects like Project X, you would make $122,811.00. If you filled all 2,444 hours with projects like Project Z, you would make $257,427.00. In this context, taking on more “Project Z’s” will produce literally DOUBLE the profit in a full year. By tracking your time, and associating a dollar amount to each hour you work, you’re better able to figure out the true return on investment for the work you do. In the 1920’s and 1930’s, Elton Mayo conducted a series of experiments at Western Electric’s factory at Hawthorne just outside of Chicago. The purpose of the studies was to determine workplace productivity – what aided and contributed to it, and what hurt productivity. For example, Mayo wanted to find out if things like a certain amount of light in the work-space increased or decreased productivity. Here’s the kicker, though: actual changes to the environment were negligible when it came to productivity; what mattered was that the employees were being observed and engaged about their performance. In other words: the best way to increase productivity has little to do with environmental changes (like open office space, or whatever), and much more to do with being observed and engaged about productivity. This later became known as The Hawthorne Effect. Whether you’re in a remote team, or working by yourself, it’s tough to create an atmosphere of observation and engagement. That’s why I love time tracking: tracking your time is a way to put The Hawthorne Effect to work for you. If you have your team track their time, then engage them about the best use of their time, I believe you can create a “virtual” environment that is similar to what Mayo perceived at Hawthorne in the 1920s. Yes, this is anecdotal (so take with a grain of salt, please – and test for yourself), but I have found that I work better when I’m aware of how I’m spending my time, and I have seen my team improve their individual and collective productivity because this is something I do care about, and engage with them about (the last thing I want to do is waste people’s time with low-value activities, and my team knows this). Bottom line: tracking time can increase your personal (and business) productivity. What Time Tracking Software Should I Use? Okay, so you’re sold on tracking your time, but what tool should you use to track your time? Because there are a lot of tools and software for time tracking, I’m not going to cover them all. My intention with this article is merely to share my experience with you based on what I have used (so please understand this is not exhuastive). That’s why I wan to highlight two of my favorites: Toggl and Everhour. Toggl is time tracking software that allows you to easily track and report time through their website, desktop and mobile apps. Toggl is clean and simple to use, which is why I’ve been using it for the past few years to track my time. The free version is robust. There are lots of good reasons to pay for Toggl Pro, but it’s nice that you can use the software for free and it’s not so limited as to be useless. Project and task creation is intuitive. You are able to create projects in Toggl which allow you to label and sort your time tracking entries. In addition to the overall project, you can also add description of the particular task you were working on. Creating reports is simple, and you can download your reports as a CSV files for further analysis. Team time tracking is relatively simple. You can examine total time spent on a project (even across your whole team) to help you identify ROI. However, for me, there is one big downside to Toggl: it doesn’t integrate with Basecamp 3 (which is what my team and I use for project management). Seems minor, but if your time tracking software is not integrated with your project management tool of choice (whatever you use to create and assign tasks), then the best you can do is attempt to mimic your time in something like Toggl. Not only does this take more time to track (thus reducing the main benefit of time tracking in the first place – which is to save you time in the long run), but the data can become less detailed and less accurate. In the end, this affects how well you can optimize your time, thus limiting the usefulness of time-tracking. Everhour is a powerful tool for time tracking. It integrates with project management and CRM tools such as Basecamp 3 (woohoo! ), Asana, Trello, and more. Like Toggl, Everhour’s software allows you to create tasks, track time, run reports, etc. But thanks to the integration with Basecamp 3, every single task in my Basecamp has a time-tracking button right next to it. I can then click that button as I start work on a specific task, and Everhour will automatically populate it’s reporting with that task, the project, and current and accrued time on the task. You wouldn’t think this is a game changer, but for me, it feels like it. You can save more of your time (by wasting less time tracking in separate software). Because Everhour integrates directly with Basecamp 3, I save time by not having to duplicate or create new tasks in a separate program…and that also means I don’t have to switch between software / screens / programs to start and stop tracking my time (less transition = less wasted time).  Awesome reporting tools. Everhours reports are incredibly robust and flexible. I can track by team member, project, task, and more. I can easily create and save simple reports for quick reference (like an employee daily / weekly report to see what time was spent on which projects), and more elaborate reports for business development purposes (like which projects were actually worth our time and attention?). Regardless what you use to track your time, here are some of the techniques I use to get the most from my time tracking effort. What’s the goal of your time tracking? Is it to maximize your work hours? To get more done in less time? To make sure your team is working productively and at capacity? Based on your goal, you may want to track and analyze your time tracking in a certain way. For me, I want to know how much time my team and I are spending on projects, and specifically, what tasks take the most amount of time so I can figure out ways to streamline and improve our process. 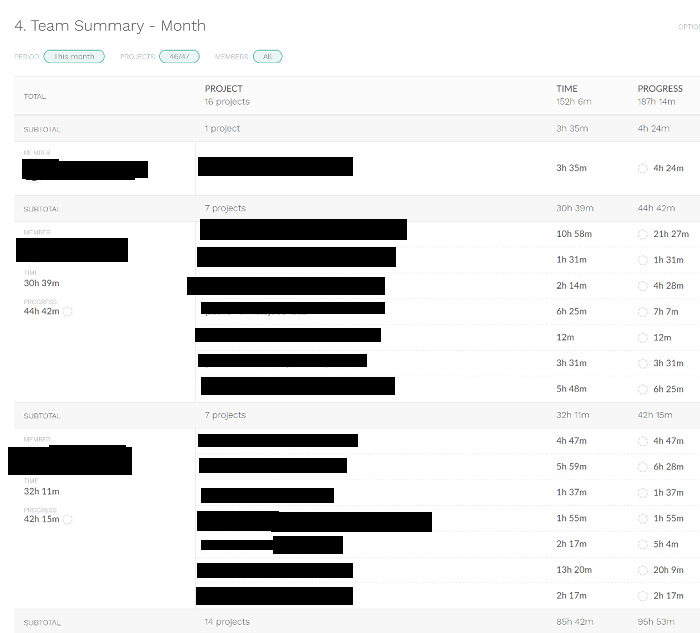 This means I want a granular look at every task completed by every team member, every day, for every project. This also means I want to review this weekly, monthly, and quarterly to aggregate data to make educated decisions on where to improve our processes. If you’re tracking your personal time to reduce time-wasting activities – you may not need something that tracks in as much detail as I shared above, and you may want to review your reports daily so you can incrementally improve your productivity and time-management every day. Your goals should determine how you track and analyze your time. Here’s the deal: If you are too generic with your time tracking (e.g. “working on Project ABC”), it will be hard to use that data to improve your systems and processes. Conversely, getting TOO detailed (e.g. “open up new tab” “type in URL” “scroll down sheet”), will kill productivity and is just as useless as the former. The key is to create detailed, useful task lists, where you can see time spent on specific parts of a project, so you can identify bottlenecks. For example, because Everhour integrates directly with Basecamp 3, I can associate a time to every task. That means I take time to make sure our task lists are clean, clear, and useful. And because I want to be able to improve our processes, I do get pretty detailed. For example, I don’t just create a task that says “networking” – instead I break it down by the person I’m connecting with, and further break it down by preparation (how long does it take me to research someone? how long does it take me to prepare for a call? ), the connection (how long did the call take? ), and post-call follow up (how long did it take me to follow up on any promises I made to them? and if they end up being a good fit for a project, how long did it take me to schedule and coordinate next steps). Yes, it seems like a lot – but this granular detail has helped us to change the way we collect, input, and share data across the team. And once people get in the rhythm of creating useful tasks and measuring them, it becomes second nature. What’s the point of all this great time tracking and analysis if you don’t change, modify, and improve what you’re doing? Like with everything in life: knowledge is step one, but then you need to make the hard choice to change. And then there are many more that are systems and process related that I won’t go into, but have had an amazing positively effect on my team and our work. Making changes based on analysis isn’t always easy, but it’s definitely the most valuable thing you can do. So I just shared some reasons you should track your time, and my software preferences for doing just that. Let me know if the comments below whether you track (or don’t track) your time, and why? And I’d be particularly interested on how tracking your time has improved your personal or business productivity. Love this post and how you put a new take on time management and productivity. This is great for me, someone who works in coffee shops and I don’t always have perfect control over my external environment. I’m using rescue time right now and set a few daily goals like trying to spend more than 2.5 hours in Google Docs every day. If possible, I think it would be really cool to see a follow up survey examining how people spend their time. Might even be cool to do some breakdowns of how different industries, business models and stage of business spend their time differently. I’m not sure if it’s but I would love to know for my own benchmarks and daily planning. I would love to do a survey and collect some data. That said – if i could get people to implement toggl or everhour, would be very fascinating to see how people use their time. Tom- on top of being handsome and sharing terrific implementable techniques, you offer those tips in an easy-to-read format. Thanks. I’m forwarding this to some friends. Virginia – thanks so much. Appreciate the kind words and especially the share!! Nice info. I am a photographer and teacher starting to use Toggl in my workflow. I don’t know if is a new function but looks like Toggl now can connect with BaseCamp.